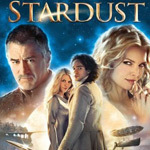 Stardust is an entertaining romp. It’s a nice breather for fantasy fans who might want a break from the heaviness of the Harry Potter or Narnia movies. The bonus features on this DVD are sparse, but the movie is certainly worth watching. Did I mention Robert DeNiro as the leader of a merry band of sky pirates? Based on a graphic novel written by Neil Gaiman and illustrated by Charles Vess, the story begins in Victorian-era England. The village of Wall sits next to a wall with a gap in it. The countryside seems to continue on the other side, but there’s actually another world there, the magical kingdom of Stormhold. On the England side is Tristan (Charlie Cox), a dreamy young man who thinks he’s in love with Victoria (Sienna Miller), the town beauty. She assigns him a seemingly impossible task to win her love — retrieve a star that fell on the other side of the wall. As it happens, stars that fall into Stormhold are living things. In this case, the star is a beautiful, high-spirited, young woman named Yvain (Claire Danes). Viewers will quickly realize that Yvain is a better match for Tristan than the snooty Victoria. There will be plenty of obstacles to overcome before the two realize that they belong together, but that’s the fun of the story. It seems that many others want to capture Yvain as well. There’s a witch (Michelle Pfeiffer) who wants the star to keep herself and her sisters looking young. There are murderous princes vying for their father’s throne (their dead brothers comment on the action like a Greek chorus). The subplots nearly overwhelm the story (did I mention Robert DeNiro as the leader of a merry band of sky pirates? ), but in the end they add spice to the heroes’ journey to happily ever after. The DVD has the obligatory making-of documentary, “Good Omens: The Making of Stardust,” which is full of interviewees saying how much they loved making the movie. The best moments are with Gaiman, talking about his inspirations and expressing amazement at seeing his ideas come to life. A blooper reel has five minutes of actors bursting into laughter or bumping into things. The DVD also has five deleted or extended scenes, lasting a total of six minutes. None of these scenes needed to be in the movie. Both the wide screen picture and Dolby 5.1 surround sound are excellent on this DVD. After watching the movie, check out the blooper reel and the deleted scenes. Skip the behind-the-scenes featurette.